I don't want it to be battery powered, but i have to powered it with usb charger,5V or 12v alimentation. It has to communicate with me, so i wanted a RGB led, and a buzzer, so if i want a blink or a simple buzz or melody, for exemple in a room where i can't hear the doorbell, or beep with the RFID scan, it can do that. So i have tried to do this as compact as possible, but i also wanted it to be easy to build. That's why i have keeped an arduino nano instead a pro (it's still very cheap), who's avoid me to add a lots of smd components. 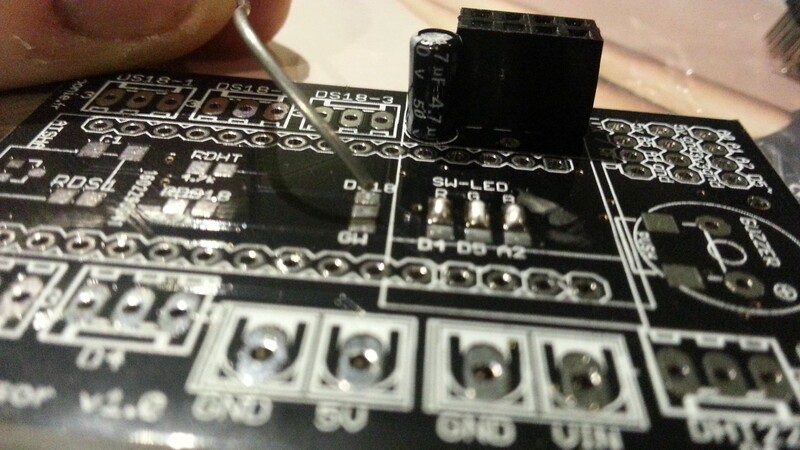 To keep it pretty small, i have to use some smd, like resistors and the RGB led. For security, i have placed a spot for an ATSHA in SOT-23 package, with his smd resistor and capacitor. I have placed two other digital pin with a fan plug (KF2510 3P), to be used with relay and/or motion detector. I have placed in the left top of the board some bonus connector, just in case : three analogics pin, one digital PWM pin, and one 5v, one 3.3v and two ground pin. And finally, for the case it will be used in a Gateway mode, i have placed a push button for insertion (actually useless for me with Domoticz). In the case of using the board in a Gateway mode, you have to shorten a switch to the GW pin, in other case, shorten it to the DS18 position (activation the activation button will deactivate the ds18b20). In the same way, the three colors of the RGB led can be used instead of three analog/digital pin (R/D4, G/D5, B/A2), so we can choose for exemple just one color of the led, and still use the two other pin for sensors. The project is still in progress, i actually testing the board.